It’s another weekend in Fall, so it must be time for another race, and with that, another race report! This weekend we found ourselves at the Goosebumps 24 and 6 hour run. This is a charity event to support the Local Lupus Alliance in their efforts of helping people and families affected by Lupus. The reason we decided to do this race was due to my wife. In her training program she needed a 26 mile run this weekend, and the idea of doing it on a looped course with an aid station was very appealing. I only needed 12-13 miles, so this race would work for me as well. Timed races are all about setting your own goals, as you can run as much or as little as you want, and it’s all about getting as far as you want to go in the time allowed. Our original intention was to do the 6 hour run, which started on Saturday at 10am. At the last minute we decided to switch over to the 24 hour run so that we could start very, very early in the morning, avoid the heat of the day, and have some buffer time if my wife needed longer than 6 hours to complete her goal distance. Again, one of the advantages of a timed race like this is the ability to start and stop whenever you want/need. We chose to drive down to LaCrosse, WI the night before to pick up our packets, and then hit the hotel to get a bit of sleep before beginning. The race had already started at 2pm on Friday, so runners were circling the area with their headlamps bouncing along the trails. We got our packets and chatted with the race director briefly before getting a few hours of sleep. Our alarms went off at 4am, and we quickly got ourselves ready and out the door for the day’s adventure. We arrived at the site and started running at 5:30am. At this point it was still pitch black, so we were going to experience the trail with only our headlamps to guide us for at least 2 loops. 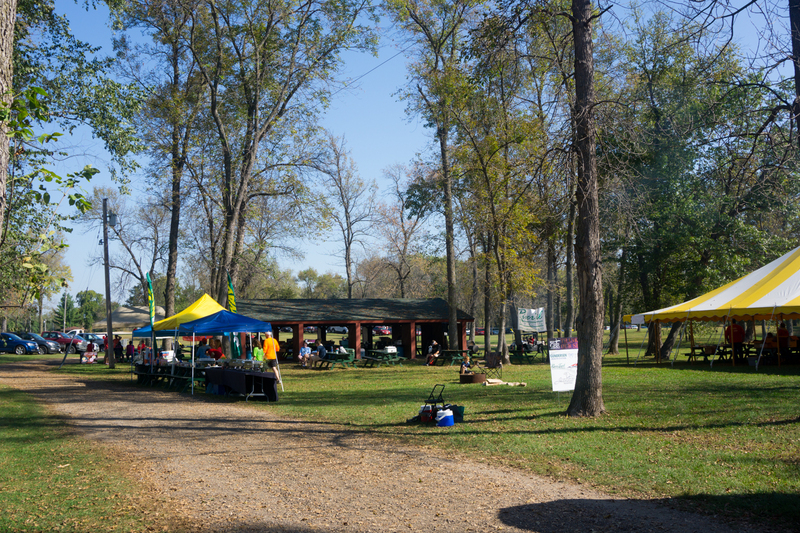 The race takes place at Goose Island Park in LaCrosse, in a small portion of woods and ponds in the river flats. This meant that the course was very mild and very flat, with very little technical difficulty. However, there was one obstacle that we had to overcome right away on our first loop. Within an eighth of a mile of the starting area, we encountered some wildlife. A skunk sauntered out from the bushes and started trotting down the trail in front of us. We thought he’d just dive back into the bushes when he saw us behind him, but no, he had other plans. He started heading down the trail in front of us, doing a serpentine weave back and forth, causing us to have to slow down and unable to get around him. At one point I tried to stomp towards him to get him to run away, but that simply caused him to raise his tail. Seeing a skunk raise its tail in your direction makes you back off really fast. For almost 3/4 of a mile we had an animal pacer keeping us to a leisurely walk/run. Eventually, the skunk pulled off the trail and left us alone, allowing me to start into a nice run on a beautiful morning. 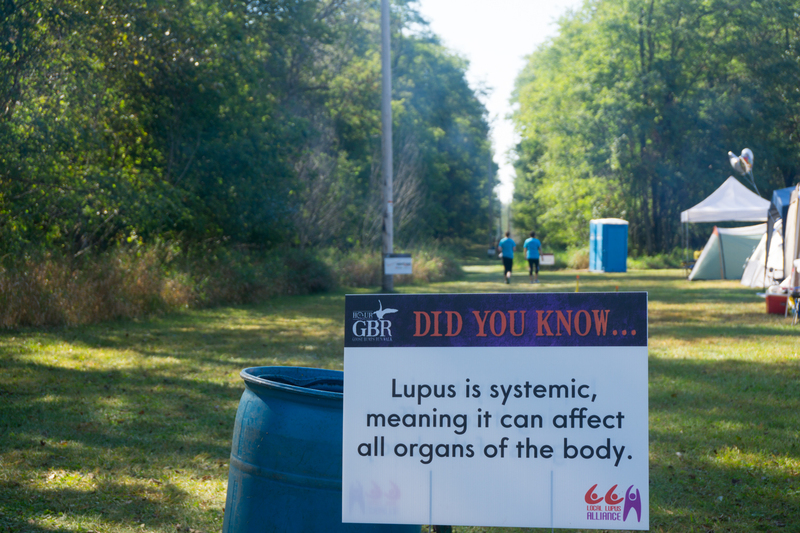 The course is a 2.8 mile loop with an aid station that was more like a grand buffet than an aid station. I completed my first loop in total darkness, and headed out quickly for loop 2. As I completed the second loop the sun was providing enough sunlight that I was able to ditch my headlamp and for the first time actually see the surrounding area that I was running in. One of the advantages of running loops between darkness and light is that every one of my first few loops felt like a totally different course. No loop looked the same because of the transition between darkness, and then pre-dawn/dawn, and then daylight. This made the first parts of the race pass by incredibly fast. Before I knew it, I was already 4 loops into my goal of 5 loops for the day and feeling pretty good. As I finished my 5th loop my brain started to think about how I wanted to spend the rest of my morning. I promised my wife that I would run her final lap with her to help encourage her. Her final lap would put her at a total distance greater than anything she had ran in the past, and we both knew that it would be a struggle. Therefore, I knew that I needed to make sure I wasn’t completely wasted when the time came for me to pace her. I also knew that I didn’t want to just sit around all morning either, as my legs would probably freeze up if I didn’t keep doing some form of movement. 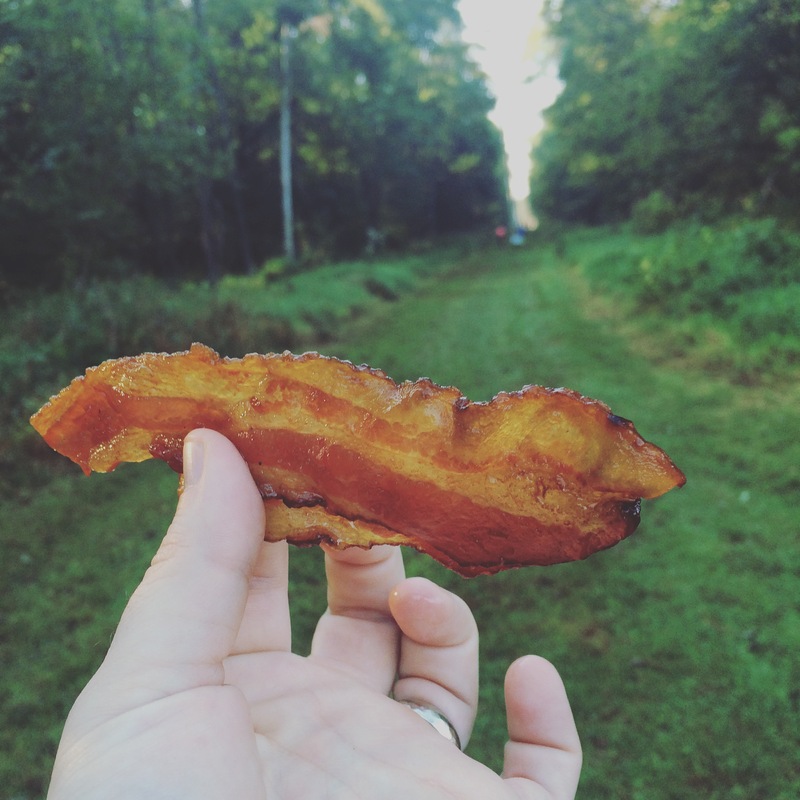 By this point the breakfast feast had started and I was grabbing handfuls of bacon every loop, so my fat reserves were doing well, along with my general energy level. I decided that for loop 6 I would walk, and enjoy the scenery. I actually really enjoyed myself on that loop and spent most of the final parts of the loop chatting with a guy who had never ran more than 15 miles and was currently around mile 70-80 of his attempt. It was fun to talk and kill the time on the way back to the aid station. He didn’t think he was going to make it to 100 miles, but he was OK with that. I’m pleased to report that as we were leaving he was coming into the aid station one last time, with only minutes to spare, having achieved just over 100 miles! After loop 6 I ran into a friend of mine, Tim, who was wandering around the area after having done some running in a different part of town earlier in the day. He and I chatted a bit, and then I noticed that it was getting close for the 6 hour runners to start their day. I made a quick decision that I wanted to get back out on the trail and get another loop in before the trail got really crowded. I headed out on my 7th loop doing a run/walk, and starting to feel my legs get heavier. At this point I finished the 7th loop at 19 miles and decided to call that good for my personal “race” of the day. My wife’s goal was 10 laps, and she was a good lap behind me, so I still had a bunch of time to kill. After grabbing more food, and more bacon, I went to the car and got my nice camera out of the trunk. I decided to do a very slow walk along the loop, and treat it as a photo walk, taking pics along the way. The pics in this blog are from that walk (I’ll post the full set tomorrow). I had a great time taking pics and even got to see a cool unique bird at one point. After completing my 8th lap I put my camera away and decided that it was time to just wait for my wife so that I could do a victory lap with her. I also made the deliberate decision NOT to run another lap as I wanted today to be her day, and if I would have also done 10 laps it would have detracted from her accomplishment. Therefore, I hit the bacon table for a couple more pieces and spent some quality time stretching as she finished her 9th loop. The time came for us to start the 10th loop and I could tell she was hurting. She had fallen a few times on the trail (mostly before dawn) and her ankle had rolled 2-3 times as well. She had changed shoes and that seemed to help, but she was having a lot of pain from all the bruising. We started out at a walk, and we kept it to a slow pace for the first mile. We attempted some short stints at running, but for the most part I paced us at a brisk walk. About a quarter mile from the end I informed her that it was all over, and we were going to run that last part. She tucked in next to me and we managed a nice 11:30 pace into the final aid station. She had completed close to 28 miles for the day, longer than I have ever run myself. 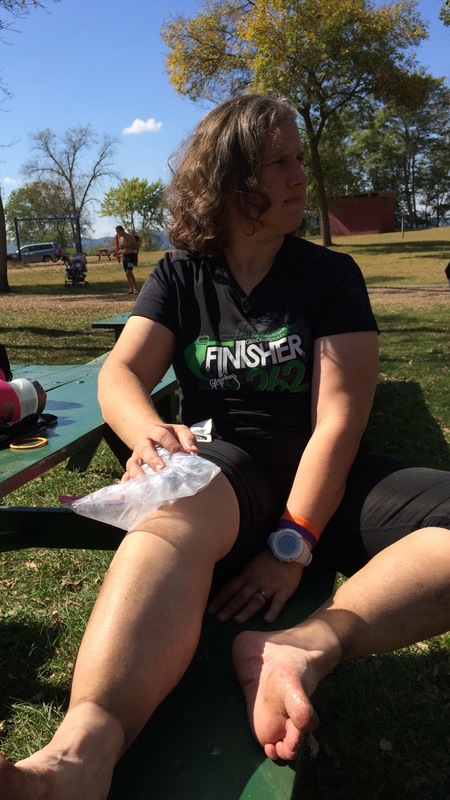 We found a nice picnic table, gathered up some ice in a bag from the nice aid station folks, and she began nursing her bruised knee. By this point the beer truck had shown up, and because this is Wisconsin, it was self service taps. I grabbed a couple quick glasses of beer as we relaxed from the day. Our friend Tim came over and joined us to chat for a bit, and I, of course, grabbed a bit more bacon. As the time approached 2pm, the 24 hour race was coming to a close. We watched some of the final people come across and congratulated them and began our long drive home. A timed race such as this, was a completely new experience for me. I loved the feast of real food that was available for fueling. It made my stomach happy to not be loaded up on simple sugars, and since I was going so slow, my fat burning was in high gear. I also loved the distance on the loop. Just under 3 miles was enough to make it easy to “just do one more loop”, yet not so far as to feel like you made a mistake when you got halfway into the loop. I loved the idea that everyone was able to set their own goals, and change them depending on how the day or night was going. Some folks started running Friday, ran for a few hours, climbed into a tent and slept for a few hours, and then started in again. Other folks showed up late and got in 20-30 miles and called it good. There was a ton of variety and a lot of freedom as a runner to do what worked for you. My thought after this race, is that next year I’d like to plan on a 24 hour race, and make 100K my goal. I feel like that would be a good way to accomplish a distance such as that, without the pressure of a full 100K race. Plus, if things fall apart I could still shoot for a solid 50 miles and feel accomplished. The volunteers who helped with this race were incredible, many of them staying up all night to keep things running. The food was amazing and there was so much variety that you were never wanting for much, nor bored with your choices when you came through the aid station. The atmosphere was relaxed and everyone was enjoying whatever they came to achieve. This is a race, and race style, that I could see myself doing again in the future. Overall, a really great day of running.